Justin Bailey recently built this masonry heater in Tesuque, NM. Bailey is one of the only contractors in The Southwest that offers design/build services for this type of fireplace, sometimes called a masonry stove. Bailey, owner of Baileys Chimney, LLC, is New Mexico’s only member of the Masonry Heater Association, an international organization. He attends the MHA annual meeting every year in Wildacres, A retreat center on top of a mountain near the Blue Ridge Parkway. The annual meeting is a festive, educational event that lasts for one week. 120 Masonry Heater builders, designers and enthusiasts from a dozen countries gather to build heaters, share knowledge and expertise, and test new Heater designs. Masonry heaters channel the flue gasses through passageways in the core of the heater so the mass absorbs the heat. One fire a day In this heater, and the house will stay warm 24/7. When the flue gasses leave the fire chamber they are over 1500 degrees, and when they leave the heater they are only 300 degrees F. All that heat remains trapped in the heater, which provides radiant heat to the room over time. The radiation waves from a masonry surface are longer than radiation waves from a metal surface. The long radiation waves heat up all the mass in the room, rather than heating the air. Masonry heaters are the most efficient way to heat with wood, if you measure the percentage of the energy in the fuel that gets converted to warmth in the room. If you are interested in a custom masonry heater for your home, give Bailey a call. http://www.baileyschimney.com/wp-content/uploads/2018/04/masonry-heater.jpg 810 1080 jheveron http://www.baileyschimney.com/wp-content/uploads/2017/09/Chimney_service_Taos_Santa_Fe.png jheveron2018-04-27 15:57:152018-04-27 15:57:15Interested in a custom masonry heater for your home? This may sound crazy, but believe it or not heating your home with wood in an EPA approved, contemporary, efficient wood stove is good for the environment. What? That can’t be true. It’s true. Let me explain. It begins with the cycle of life. As a tree grows, it does this magic thing where it mixes carbon dioxide (CO2) from the air, water (H2O) from the ground, and solar energy from sun to create wood fibers. Well, its a little bit more complicated than that and there’s even a chemical formula for this thing trees do; its called photosynthesis; but the bottom line is that trees collect CO2 from the air and while they do that, they put Oxygen out into the air and so its a great deal all the way around, this carbon cycle of life. Yeah but so then how does burning wood in a wood stove help the environment? According to a lot of scientists, there is a phenomenon called global warming that is caused by something called the greenhouse effect, which is caused by too much CO2 in the air, which some of those scientists have gone way out on a political limb and ventured to say there is too much CO2 in the atmosphere because of the stuff we humans burn to provide for our energy needs. Of course they say it in a bunch of scientific words some of us don’t really understand but the gist is that when billions of humans are constantly burning things like coal, natural gas, propane, and petroleum products such as gasoline and diesel, etc, it releases billions of tons of CO2 into the atmosphere, which then somehow makes everything a little bit warmer, which is causing the glaciers to melt away, the seas to rise, and lots of bad hurricanes and whatnot that messes stuff up. For the skeptics out there, I’ll just mention that when I was in the Bolivian Andes a few years ago and when I was in Glacier National Park last year I saw with my own eyes, via photos taken of the glaciers over the past 100 years, that the glaciers are indeed melting away and are more than halfway receded from where they were 100 years ago. Yeah but so what does that have to do with burning wood in a wood stove? 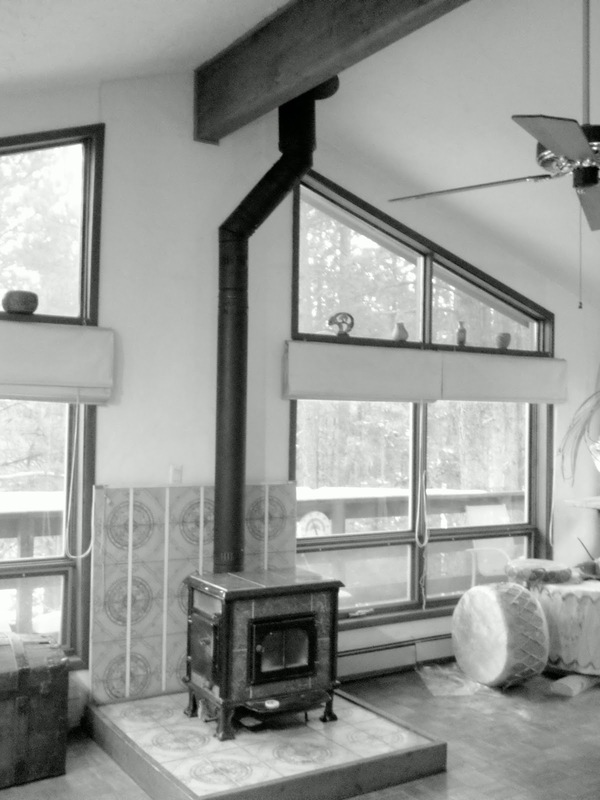 Doesn’t burning wood in a wood stove also produce CO2 that gets released into the atmosphere? Well, yes in fact it does. But the CO2 released when you burn wood in your wood stove is the exact same amount of CO2 that was collected by the tree when that tree was busy producing that wood. But I don’t have a wood stove. If you care about the environment, and you live in a somewhat rural, forested area, you might want to get one. Because see if you can follow me here. a) A live tree grows and while it grows it collects CO2 from air. b) The tree eventually dies, whether from natural or manmade causes. c) Wood from dead tree either either burns in a forest fire or decomposes or is converted to building products or paper, which building products or paper or whatever will eventually either burn or decompose in the overall eventual scheme of things, because, like, ashes to ashes and dust to dust and all that. d) Whether the wood from the tree ends up burning (in a forest fire or a wood stove) or decomposing (on the forest floor or in a landfill), it releases the same exact amount of CO2 into the atmosphere as it collected from the atmosphere when it was engaged in photosynthesis, living and growing. e) That exchange of CO2 that trees do is part of the NATURAL cycle of life. When the tree is alive it borrows the CO2 from the atmosphere. That CO2 will be paid back at a later date. f) So burning some wood in the wood stove doesn’t add any CO2 to the atmosphere that the atmosphere didn’t have coming to it anyway, eventually. Yeah but so if you burn the dead wood from the dead tree the CO2 gets released into the atmosphere a lot faster than if the wood decomposes and if you think CO2 causes global warming then you are causing global warming by burning wood in your wood stove. Yes and no. If the dead wood stays in the forest and the forest catches on fire and the whole big giant tree burns all at once, a lot more CO2 gets released a lot quicker than if that dead tree is harvested and burned little by little as a source of heat for your home. And meanwhile, the wood gatherers who go to the woods and gather the wood to sell for firewood are mostly required by law to only gather wood that is already dead, except in some cases where its part of a forest thinning project that somebody smart determined is good for the forest for forest fire prevention reasons. So if you get your wood yourself, or buy it from an honest vendor, you can be reasonably certain that the wood was already dead when it was collected from the forest, or if it wasn’t already dead, it would have eventually ended up burning in a forest fire anyway. And meanwhile that same dead wood, if it stays in the forest, makes forest fires more likely to occur and more severe if/when they do occur, which by the way, a lot of really smart people are starting to say one of the results of global warming is, what do you know, more forest fires and worse forest fires. So anyway, it is actually GOOD for the forest to collect firewood, as long as that wood is dead when you collect it or taken from an area where the forest needs thinning anyway. Okay but so why do you keep saying wood stove, wood stove, wood stove? What’s wrong with a fireplace? Don’t the same principles apply in terms of the carbon cycle if you burn wood in a fireplace. Yes those principles apply, but wood stoves have tremendous advantages. Like you get about 8 times more heat in your house from burning the same amount of wood. Yeah but my fireplace puts out a lot of heat. Most of that heat ends up going right up the chimney. The most efficient fireplace, unless it is a wood stove that is built into a wall and looks like a fireplace, like for example a BIS or other similar type appliance, is about 10 percent efficient, and will emit around 50 grams per hour of particulate pollutants, which is the sooty black stuff that makes smoke look like smoke and smell like smoke and generates a hazy inversion of smoggy stuff on cold mornings. Same with old wood stoves–look at the the top of the chimney and you’ll see it belching out smoke. Newer wood stoves, manufactured since 1990, approved by the Environmental Protection Agency to meet stringent emissions standards, emit as few as 3 grams per hour of particulate matter. My wood stove will be heating the house full blast and if you look at the top of the chimney all you can see is a little bit of water vapor coming out the top. Meanwhile, since my house is nice and warm without the use of fossil fuels or electricity powered generated by coal or nuclear, I am fortunate enough to heat my home with a local, renewable form of energy. And that is why heating with wood is good for the environment. And so I’m all out of time for now, but that is an explanation of why heating with wood, in an efficient, EPA approved wood stove, is good for the environment. Building a fire to keep warm is a primal, instinctive bit of work. There is some kindling to be chopped, some paper to be crumpled, some wood to be laid out, a match or a lighter light. 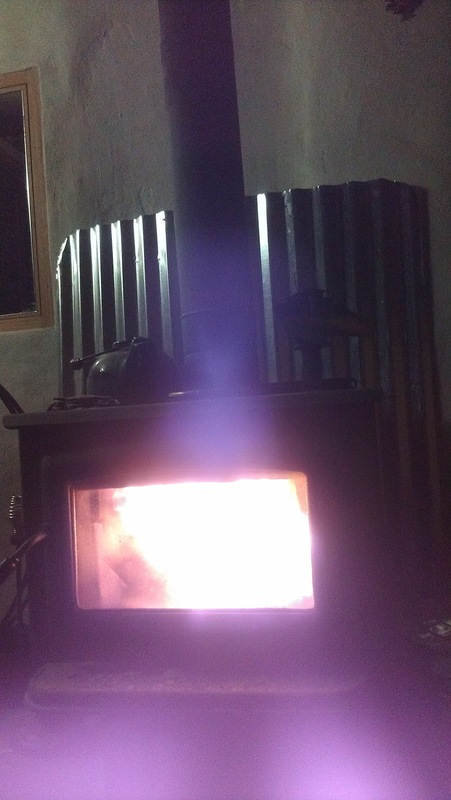 The photo above is the wood stove at my house taken immediately after I lit tonight’s fire. This appliance, a Pacific Energy Super 27 wood burning stove, is my primary source of heat in the winter. Usually I build a fire once a day, in the evening time. A few logs in the stove will burn for many hours. In the morning there are still a few live embers in the firebox and the house is still nice and warm. On a normal morning, I’ll usually let the embers die out. But when its cold, like around 15 below zero like we’ve had on a few recent mornings, I’ll lay some new kindling, a couple logs and some paper over the embers and get the fire going again. Building a fire in my wood stove keeps me feeling connected with an elemental part of life. The work involved is a kind of meditation. Its one of those actions that brings me to a place where it seems like the world as it is coincides with the world as it should be, if that makes sense. These are some of the things I sell. Double-wall and single-wall sections of stovepipe in various telescoping lengths, and elbows, 45 and 90 degree. Class A insulated chimney sections from 18′ to 48′ in galvalume or stainless, caps, flashings, roof supports, connector-adaptors, flue extensions, storm collars, support boxes, round ceiling supports, dryer vent parts, periscopes and transition ducts and rigid 4″ galvanized and aluminum venting, close clearance elbows, heat resistant caulking, fatwood kindling, ACS creosote destroyer in spray and powder, furnace mortar, stove gasket. Why not sell something big–like cars or RV’s or airplanes? Why not sell something small and expensive, like jewelry, diamonds, contraband? Or something etherial that doesn’t have to be picked up and carried around, like words, information. I don’t know: I sell chimney stuff, mainly because I’m really good at installing it, I’m like the fastest gun in the west with chimney stuff, a cordless drill in each hand when I’m putting that stuff together, my tool belt on. I know exactly which pieces match up with which other pieces, and which brands, manufacturers’ parts have which characteristics, and what makes it work. Or if in your case and it isn’t working, I know exactly why, all I have to do is come look at it, and I know which parts from which companies you can match up with with which parts from other companies if something from the other company is too expensive or unavailable for some reason. Sometimes customers just stand there watching me work. And it doesn’t matter how high your chimney is or how high your roof is, I’ll get right up there. I’ll hang ladders from the peak of a pitched roof. I walk across the ridge of an A-Frame house like a tightrope walker, chimney rods for a balance pole. Plus I’m organized. I know exactly where all of my tools are so I don’t waste time looking for stuff. My workers are covered by worker’s comp insurance. I have $2 million worth of general liability insurance. I can pretty much glance at your chimney when I drive up to your house and know exactly who manufactured it, in what country, what its missing, what size diameter it is, whether it vents a wood stove or a fireplace, or a woodstove inside a fireplace, and whether the fireplace is factory built or masonry, and after a closer look I can maybe even tell you who installed it if its a wood stove or built it if its a fireplace, if its located in Taos, NM. If everything is just right, and was installed in the 80’s, and its Canadian made Security brand Stainless Class A Chimney installed with a roof support and ceiling trim collar, and the double-wall louvered black stovepipe has faded from a sparkly black color over the years to a dusty dark-gray, it would have been installed by my grandfather. If you have a chimney that needs to be installed, swept, inspected, cleaned, or repaired, the name of my company is Bailey’s Chimney Cleaning & Repair. I have offices in Taos and Santa Fe and we service all of North-Central New Mexico. We are the only company in New Mexico certified in BOTH chimney and dryer vent technology by the Chimney Safety Institute of America.